Gentian is a large perennial herb indigenous to cen­tral and southern Europe and Asia Minor. It is a highly ornamental plant with yellow star-shaped flow­ers. Yellow gentian will grow in most deep, loamy soils in full sun and is easily grown from seed. According to Dioscorides, gentians were named after Gentius, King of Illyria, an ancient country located on the Adriatic Sea. Gentius lived in the 2nd century BC and was the first, apparently, to discover the medicinal properties of gentian against the plague. As a medicine gentian has been used at least since the time of the Ancient Egyptians and was employed by Pythagoras in 6th century BC as an antidote to poisons. In the Middle Ages, gentian was valued as a panacea for all ills. Before the days of quinine it was taken for malaria. Culpeper said that gentian was ruled by Mars, and claimed, ‘it resists putrefactions and poisons; a more sure remedy cannot be found to prevent the pestilence than it is’. Gentian root contains one of the most bitter sub­stances in the plant world, the glycoside amarogentin. The bitter receptors in the mouth, on contact with gentian, stimulate the flow of digestive juices and enzymes throughout the digestive tract. The appetite, digestion and absorption are enhanced, and elimina­tion of wastes improved. Gentian increases the flow of bile from the liver and promotes the movement of food and wastes through the digestive system. Gentian can be given for a wide range of digestive problems, and for problems associated with inflam­mation. Its excellent effect on the digestion gives gentian pride of place as a strengthening tonic, useful in cases of general debility, weakness following illness and lethargy from poor absorption and weak diges­tion. Gentian has traditionally been added to alcoholic drinks and to this day several bitter aperitifs include extract of gentian. Gentian was also tradition­ally taken as a spring bitter tonic to purify the blood. It is a useful herb for clearing worms and infections from the system. One constituent of gentian, gentiopicrin, is highly poisonous to plasmodium, accounting for its wide use as a malaria remedy. Gentian with its detoxifying action has also been used to treat rheumatism, arthritis and gout. It acts as a febrifuge, bringing down fevers, and has cooling properties. Gentian has a stimulating effect on the female reproductive system, bringing on periods and regulating menstruation. It was a considered a valu­able remedy for ‘female weakness’ and hysteria, and was given as a tonic to the nervous system. 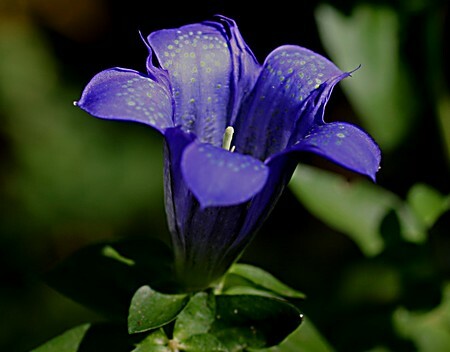 Gentiana is also given as a general tonic and as a remedy for digestive problems. It helps nausea, acidity and colic. A Gentian person tends to feel dejected and morose. Like the herbal remedy, gentiana is used for rheumatic pains, headache and vertigo. Gentiana is also prescribed for fevers, with febrile shuddering like electric shocks, followed by lassitude, depression and tension in the limbs. 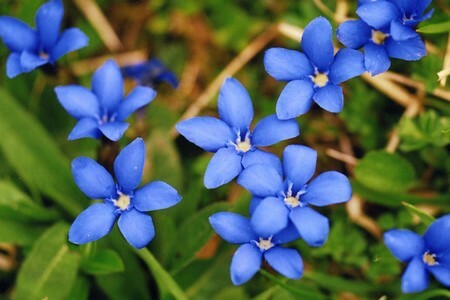 The Bach Flower Remedy uses Gentiana amarella, a variety of gentian with small lavender-to-crimson flowers. It benefits those easily discouraged and prone to despondency and depression. A gentian per­son at worst is the eternal pessimist, often bitter, and almost gaining satisfaction from seeing things go badly for them. They worry constantly and analyse everything that could be of some benefit to them so that they become sceptical of its ability to help them. The ‘doubting Thomas’ in them prevents their believing in anything they cannot grasp with their constantly active minds, so that they cut themselves off from their higher self, and the source of light and clarity in their lives. Gentian helps people to have more faith in them­selves and others, and more confidence and trust in their innate healing abilities and those of others. With gentian they should be able to cope better with setbacks and difficulties and be less prone to despon­dency and despair, realizing that conflict and challenge are an integral part of human life.